The Special is aptly named and, for us, has that little extra ‘something’ about it, a rather beautiful modern take on classic vintage tone. Not everyone will get the altered shape and modernist vibe. While the pickup specs on the new Specials remain the same as the original Ashburn and AJ, it’s the body wood that’s switched from alder to ash, while the neck - available with either maple (as here) or rosewood fingerboards, like most others in the range - receives a tinted amber finish that gives a slightly more vintage vibe in combination with the subtly see-through Translucent Blonde-only finish. The Special employs a six-screw version with pressed steel saddles. Both use tapered die-cast blocks and have a push-in-and-screw arm with tension adjustment. Its tuners are vintage style but with no lock, though they do have height-adjustable posts to really dial in the behind-the-nut string angle - which is important, because this guitar does not use any string trees. The Special uses 250k pots and a .047microfarad tone capacitor. It also ditches the dished output jack plate of the Strat for a thick metal side-mounted plate. The Special sounds a little older than others from this range that we have sampled, although the reverse slant on the bridge avoids that Strat-spike that some of us find hard to dial in. Still, the bridge/middle mix is a little honkier than, for example, the recently-reviewed HSS, which sounds thick and textured with the full humbucker, the split, obviously, sounding thinner and a little more balanced. The Special’s reverse-slanted bridge pickup works really well for some very textured, rootsier gained sounds that seem everywhere at the moment. The somewhat choppy sound of the Special seems to benefit with high-end roll-off - only a little, mind - as you pull back the volume. One point to be aware of is that the volume control is placed slightly further away from the bridge pickup than a Strat’s, which, depending on how you use the volume and vibrato, might take some getting used to if you’re a die-hard Strat player. 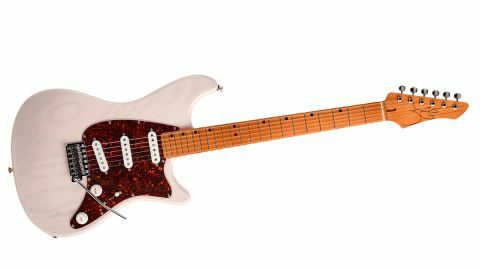 The things that have already impressed us with John Page’s Classics are reinforced here: extremely dialled-in and gig-ready guitars that are individually voiced in terms of pickups, hardware and controls - and a subtle sonic twist with a different body wood.